It is the 13th of October 2013. 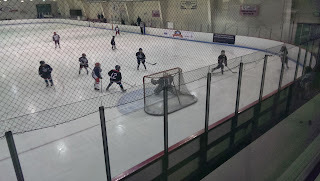 We arrived in Lynnwood Washington yesterday afternoon and managed to take in a hockey game of our grandson Ryan, they had a tournament here. We also met up with Mark, Lisa, and our grand daughter Sarah and her friend Kaylan. This morning we watched another game, which they won just nicely. So much fun to watch the young ones play. At around 11:30 am we were on the road, we took the I - 5 South. After a few pit stops at the very convenient and nice official Rest Stops, we drove through Portland OR, a very pretty city. By now we had driven several hours, the weather was beautiful, so we decided to leave the I - 5 in direction of the coast. 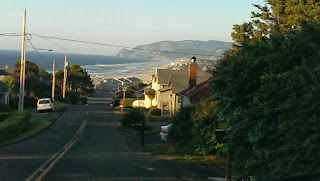 We took Hwy 99W and 18 south west towards Lincoln City OR. 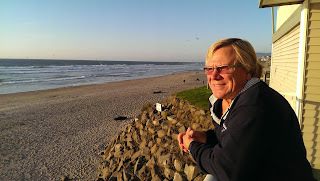 We arrived around 5 pm and checked into DSands Condominium Motel right on the beach. A long walk was on the agenda before the sun went down. Anders taking in the view of the ocean. Lincoln City is a very quaint little town. The name comes from Lincoln County which was named after.... you guessed it, the late President Abraham Lincoln. This is our second time here, and we love it. According to Wikipedia, Lincoln City was incorporated on March 3, 1965, uniting the cities of Delake, Oceanlake and Taft, and the unincorporated communities of Cutler City and Nelscott. These were adjacent communities along U.S. Route 101, which serves as Lincoln City's main street. The name "Lincoln City" was chosen from contest entries submitted by local school children. The contest was held when it was determined that using one of the five communities' names would be too controversial. 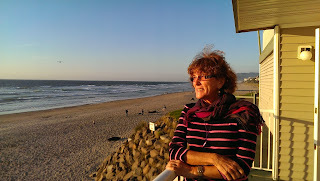 Liz on the balcony at DSands Motel, Lincoln City, Oregon. beach and watched the sun going down. Wow. Tomorrow, weather permitting, we will do a long hike on the beach again.... What can I say I'm a duck. PS. For more pictures from this part of the trip check out our web album.